This summer we took the Vanagon from San Francisco to Vancouver. There were a lot of great adventures, but my daughter and niece playing around in Air Chairs was pretty hilarious. 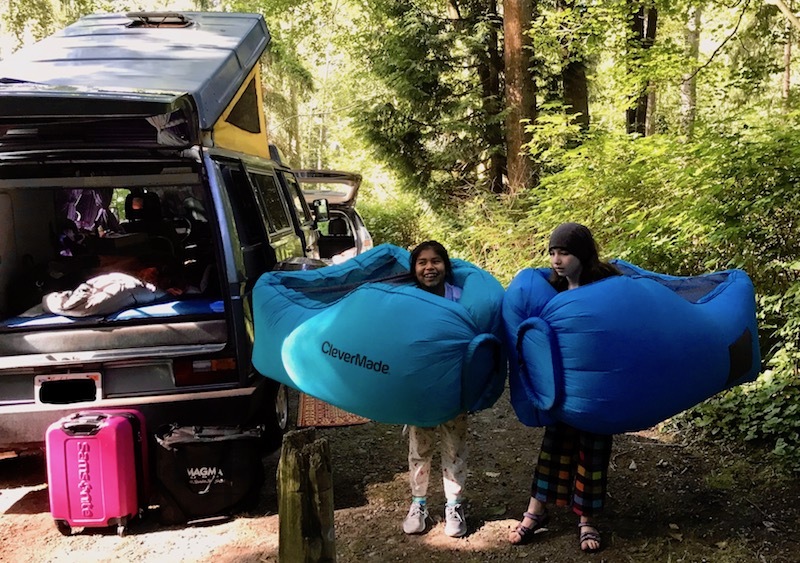 Simple to inflate, and awfully comfortable to lounge on, the kids took to wearing them around like giant bumper-costumes. Several meals were served to ½ kid ½ chair creatures in the Washingtonian woods. The chairs easily support adults. The material is strong enough they do not have a problem with punctures from the ground. Keep the chairs, and kids, away from the campfire tho. My favorite part of these chairs is how easy they are to pack and store. I am close to letting my giant, heavy duty, folding camp chairs stay home on a few trips.